"26 In the sixth month of Elizabeth's pregnancy, God sent the angel Gabriel to Nazareth, a village in Galilee, 27 to a virgin named Mary. She was engaged to be married to a man named Joseph, a descendant of King David. 28 Gabriel appeared to her and said, 'Greetings, favored woman! The Lord is with you!' 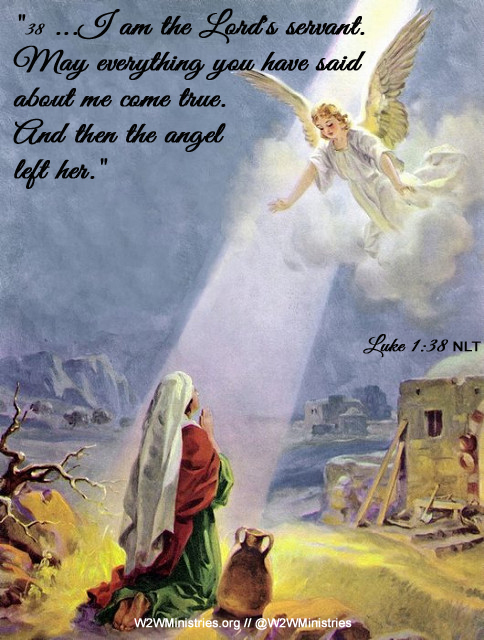 29 Confused and disturbed, Mary tried to think what the angel could mean. 30 'Don't be afraid, Mary,' the angel told her, 'for you have found favor with God! 31 You will conceive and give birth to a son, and you will name him Jesus. 32 He will be very great and will be called the Son of the Most High. The Lord God will give him the throne of his ancestor David. 33 And he will reign over Israel[c] forever; his Kingdom will never end!' 34 Mary asked the angel, 'But how can this happen? I am a virgin.' 35 The angel replied, 'The Holy Spirit will come upon you, and the power of the Most High will overshadow you. So the baby to be born will be holy, and he will be called the Son of God. 36 What's more, your relative Elizabeth has become pregnant in her old age! People used to say she was barren, but she has conceived a son and is now in her sixth month. 37 For the word of God will never fail.' 38 Mary responded, 'I am the Lord's servant. May everything you have said about me come true.' And then the angel left her." Every time I read this passage I am in awe! I think of Mary and the ridicule that she knew would follow her being pregnant and unmarried. It makes me remember back to high school. We had a couple of girls in my high school who were pregnant and I saw so many of the kids make fun of them. While I didn't make fun of them I was no better than the others because I just turned my head every time we were in the same hall! Yet in the mid-1970's the stigma of being pregnant, unmarried and in high school was nothing to what it must have been in Mary's time! What blows my mind is Mary's commitment to the Lord. She knew the kind of outcast she could become; she knew that her fiance would likely leave her. None of that mattered to her. Verse 38 displays the most amazing commitment and courage I've ever seen! "38 ...'I am the Lord's servant. May everything you have said about me come true.' And then the angel left her." I can only pray that I would have that kind of commitment to God should He call on me.